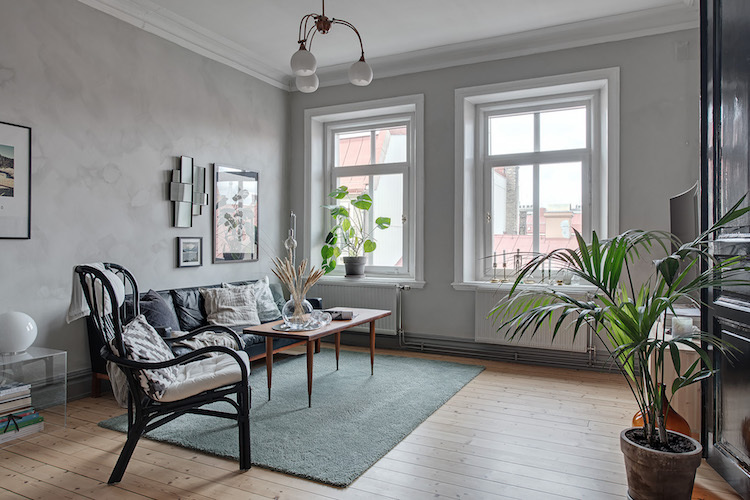 my scandinavian home: A Soft Swedish Home With A Stormy Bedroom Wall! Why, hello there friends! It's soooo stormy here today - I've battened down the hatches and am rocking about in some chunky knit socks! 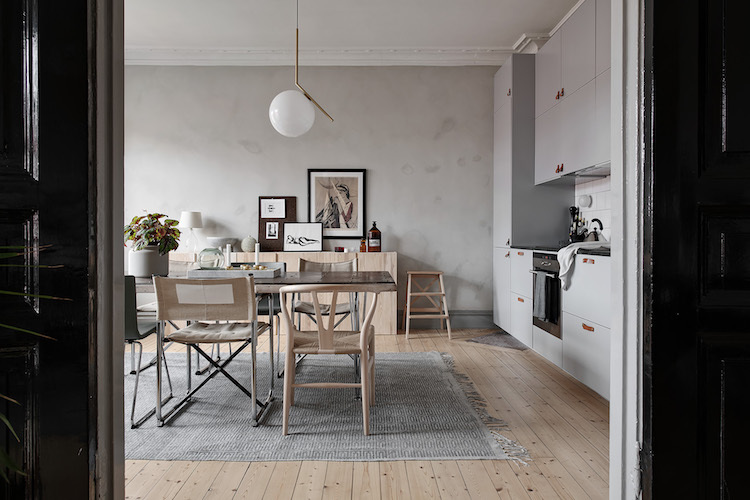 Perhaps it was my subconscious which picked out this soft, grey Swedish apartment today. The stormy blue / grey wall in the bedroom is reminiscent of the bruised sky outside - although more beautiful of course! 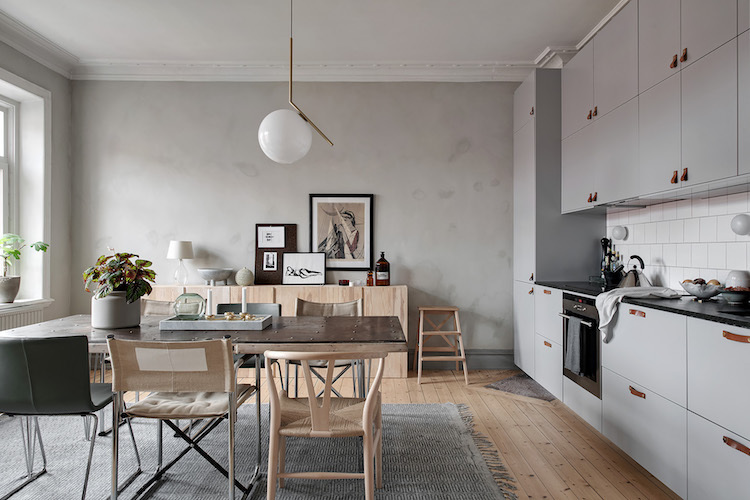 I also love the patina (more details about how to achieve this at the bottom of the post), as well as the relaxed blend of old and new furniture. I'd be very happy padding about here storm or no storm, how about you?! Love the leather handles - I believe these are also from IKEA! 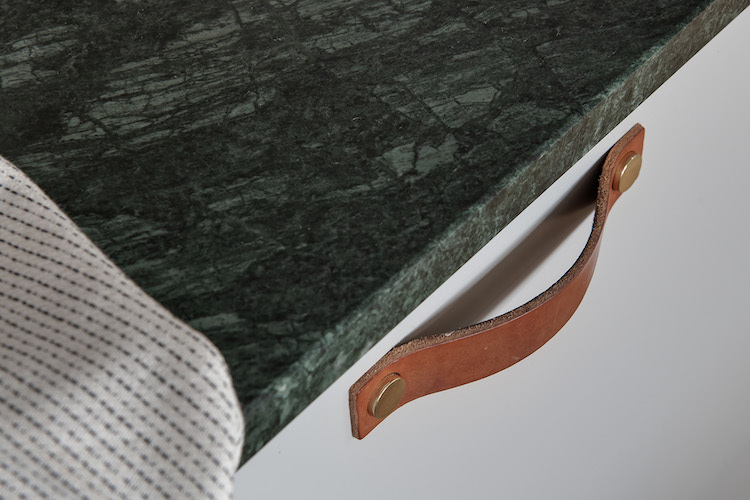 When we moved into our house 11 years ago we had the same green marble in the bathroom. I intended to rip it out, but then it steadily grew on me and today I love it. Are you a fan? Source a custom-made wall hanging like this one here*. Do you see what I mean about the 'stormy' wall in the bedroom?! It's amazing how it appears calm and dramatic in equal measure. I love that little pop of red from the balcony door too. 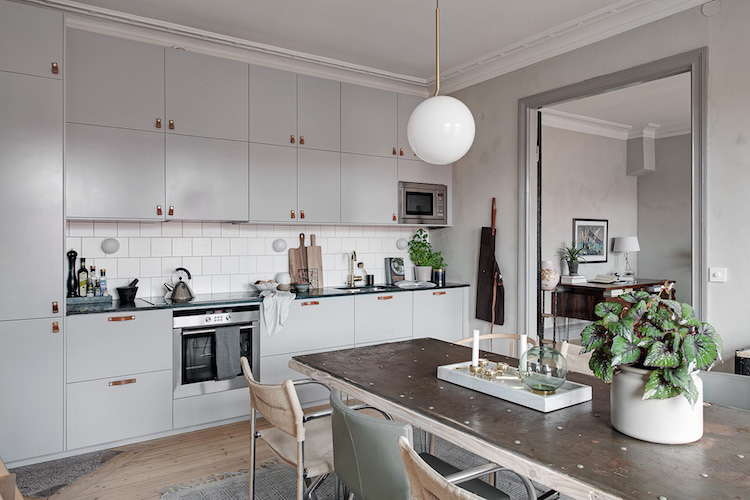 Is there anything you love about this Swedish space? I've created a similar patina on my wall in my dining room and window nook by adding Zinsser Roll-A-Tex Sand texture to the paint. The amount you add will determine how textured the result will be. FYI it's a bit of a faff - I was absolutely covered in the stuff - the things we do to get a nice home!! Do you have any other suggestions on how to nail this look? 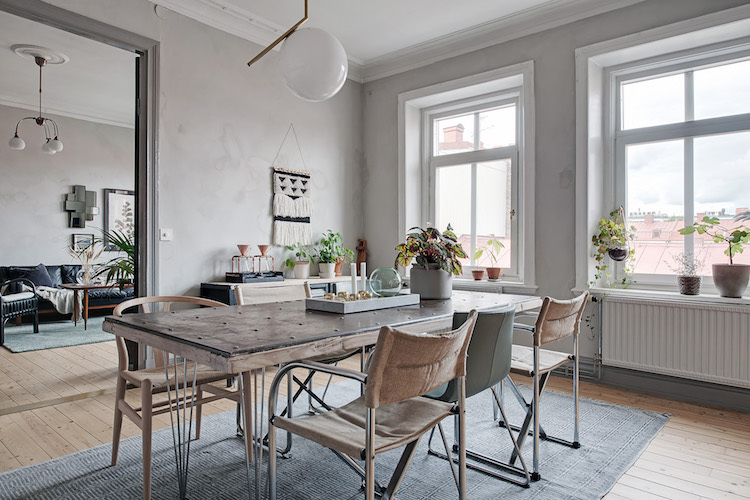 If you've also battened down the hatches today, how about popping the kettle on, putting your feet up and scrolling through these grey and white Scandinavian home tours - so beautiful! Photography courtesy of Alvhem (through whom this apartment is for sale) with thanks. I love everything about this place, especially the bedroom. I live in a place with too much sun (LA). I love the feel of this. This is a very lovely home! PS Oh how I'd love too much sun - can you send some my way around february, March time?! WOW!! this is really amazing work. I want to tell you how much I appreciated your incredibly beautiful pictures and home makeover ideas. another amazing home. i'm wondering if i should move to a scandi country. Does everyone have such lovely spaces? There are a LOT of beautiful homes in Scandinavia - come and join us! Beautiful home. I love the kitchen table and the leather handles on the kitchen cabinets. 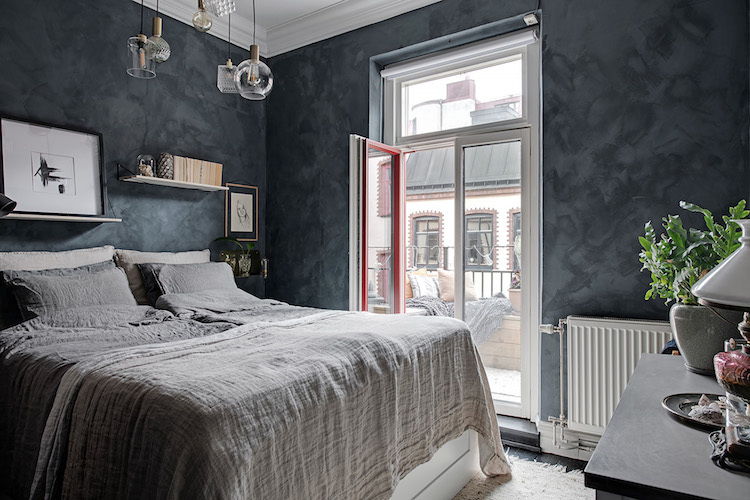 The color of the bedroom walls is very striking with the grey bedding. I love the wall hanging. 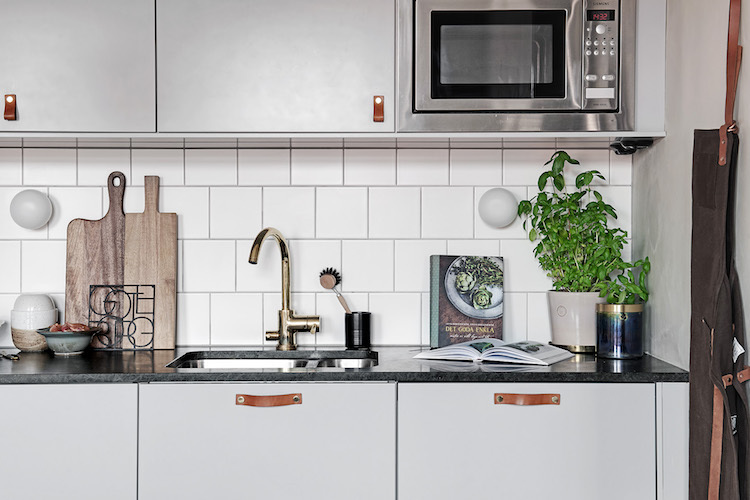 I love the kitchen too - it's popped up in a few places lately and is really distinctive thanks to the colour and leather handles.